To add Jive Contact Center to your services, please contact your sales representative. 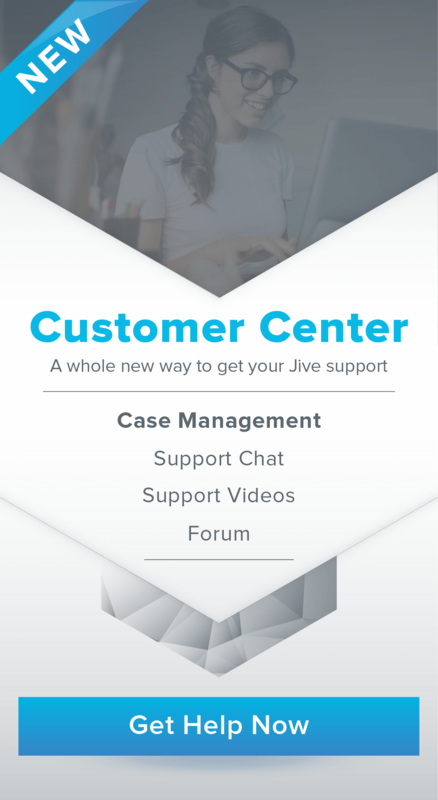 Jive Contact Center promotes a proactive approach to minimizing queue hold times and improving the caller experience by allowing you to evaluate how calls are handled within queues—all in real time. Stakeholders can easily view how long contacts are waiting and how long it takes to resolve a contact’s issue. Notifications alert you when the amount of unattended contacts reaches a predefined threshold, so you can make adjustments on the fly. Historical performance data is stored to generate various key performance indicator (KPI) reports to drive decisions concerning your operations and staffing. In order to access Jive Contact Center, you must have view reports or super admin permissions given to you by a system admin. Note: Alternatively, you can access Jive Contact Center from the app switcher within other apps. This page gives supervisors a dashboard to view key stats, the status of their agents, and the health of their queues all in one place. The data is generated in real time without needing to refresh the page. You can access more in-depth information about each queue by clicking on its name. To access the supervisor dashboard, hover over the left navigation menu and then click Supervisor. In order to access the Supervisor Dashboard page in Jive Contact Center, you must have view reports or super admin permissions given to you by a system admin. Total number of agents across all queues (on call + idle + wrap up). Number of agents currently on a call. Agents logged in to call queue but not on a call. Agents using time after speaking to a contact to file tickets, update customer information, etc. Average time an attended contact speaks with an agent. Time format changes from seconds (ss), minutes (mm:ss), or hours (hh:mm) depending on your current average. ATA over the last 15 minutes. Average time a contact waits for an agent across all queues. Time format changes from seconds (ss), minutes (mm:ss), or hours (hh:mm) depending on your current average. ASA over the last 15 minutes. Number of contacts waiting to speak with an agent across all queues. Number of contacts currently speaking with an agent across all queues. Total number of contacts across all queues (unattended + attended). Longest time an attended contact has been speaking with an agent in the queue. Current status of each contact across all queues. Time an attended contact has been speaking with an agent. Agent who attended to the contact. Queue used to attend the contact. Name by which the queue is identified. Number of contacts waiting to speak with an agent in the queue. Number of contacts currently speaking with an agent in the queue. Number of contacts attended by agents in the queue. Number of contacts that left the queue (hung up) before being attended by an agent. Number of contacts that were removed from the queue and forwarded to the next step in the dial plan while waiting to be attended by an agent—based on the Timeout queue node setting. Total number of contacts in the queue. Longest time an unattended contact has waited in the queue. This page provides real time updates on high level activity queues and general queue status. The data is generated in real time without needing to refresh the page. You can access more in-depth information about each queue and filter which queue(s) you are analyzing. System admins can enable visual notifications to display when a queue exceeds the defined warning ( ) and critical thresholds ( ). To access real time data, hover over the left navigation menu and then click Real Time. In order to access the Real Time page in Jive Contact Center, you must have view reports or super admin permissions given to you by a system admin. Filters the data by specific queues or by all queues in the system. Browse for and check the queues to be included in the queue summary and then click [APPLY]. Click on a queue to view additional data and details. Opens a visual communication tool used to publicly display real time information related to your contact center’s performance. Use the queue selector to refine which queues are displayed within the wallboard. Note: If more than two queues are selected, the wallboard will cycle two queues at a time every 30 seconds. Total number of contacts across the selected queue(s) (unattended + attended). The top five queues by total contacts are listed below. Number of contacts waiting to speak with an agent across the selected queue(s). The top five queues with unattended contacts are listed below. Number of contacts currently speaking with an agent across the selected queue(s). The top five queues with attended contacts are listed below. Total number of contacts in the queue (unattended + attended). This page shows more in-depth information (including agent details) about an individual queue so you can analyze its performance. The data is generated in real time without needing to refresh the page. To access queue details, click on a queue name from the Queue Summary. In order to access the Queue Details page in Jive Contact Center, you must have view reports or super admin permissions given to you by a system admin. Opens a visual communication tool used to publicly display real time information related to the queue’s performance. Displays the name of the queue you are currently viewing and allows you to navigate back to the Queue Summary. Tip: Hover over the pie chart for more details. Current day contact resolution totals for the queue. Totals reset each day at midnight (based on browser timezone) and are updated every 30 seconds thereafter. Number of contacts attended by agents. Number of contacts that were removed from the queue unexpectedly while waiting to be attended by an agent. The ultimate state of the contact is unknown. Number of contacts that were removed from the queue and forwarded to the next step in the dial plan while waiting to be attended by an agent—based on the Remove callers when queue has no agents call queue setting. Total number of contacts in the queue for the day. Current queue position of the contact (order in which calls will be answered). Note: A double-dash (- -) indicates that the contact has been attended by an agent. Current state of each contact in the queue. Contacts that left the queue (hung up) before being attended by an agent. Contacts that are currently speaking to an agent. Contacts that were removed from the queue and forwarded to the next step in the dial plan while waiting to be attended by an agent—based on the Remove callers when queue has no agents call queue setting. Contacts that were removed from the queue unexpectedly while waiting to be attended by an agent. The ultimate state of the contact is unknown. Contacts that have spoken with an agent and the call has ended. Contacts that were removed from the queue and forwarded to the next step in the dial plan while waiting to be attended by an agent—based on the Timeout queue node setting. Contacts that are waiting to be attended by an agent. Time used by the agent after speaking to a contact to file tickets, update customer information, etc. Caller ID of the contact. Agent who attended to the contact (the agent’s device is displayed in parenthesis). Time an unattended contact waited to speak with an agent. Time the agent used after speaking to a contact before receiving the next contact in the queue. Wrap time allows agents to file tickets, update customer information, etc. Time used to attend to a contact (time in queue + talk time + wrap time). This page helps key stakeholders analyze performance within the last 90 days and drive data-supported changes to operations. Each report can be filtered by a specific queue(s), date, and time. Additionally, some reports support data export to .csv for additional distribution and analysis. To export historical Agent or Contact data (e.g. view performance from today compared to last year), navigate to the Data Mart page. To access queue history reports, hover over the left navigation menu and then click History. In order to access the History page in Jive Contact Center, you must have view reports or super admin permissions given to you by a system admin. Filters the data by specific queues or by all queues in the system. Browse for and check the queues to be included in the report and then click [APPLY]. Filters the data by a specific date range. Click the date drop-down field to select the date range and then click [APPLY]. Note: The selected date range is shown in the calendar with the start and end dates in dark gray and the range in light gray. Today’s date is highlighted in blue if it is included in the date range. Downloads the report for the selected queue(s), date range, and agent(s) to a .csv file. This report tracks queue totals and aggregate statistics for the selected queue(s) and date range. These results focus on queue performance and the resulting impact on customer satisfaction. Average time a contact waits for an agent in the queue for the selected queue(s) and date range. Average time used to attend to a contact for the selected queue(s) and date range (time in queue + talk time + wrap time). Average time an attended contact speaks with an agent for the selected queue(s) and date range. Contact resolution totals for the selected queue(s) and date range. Number of contacts that were removed from the queue and forwarded to the next step in the dial plan while waiting to be attended by an agent — based on the Remove callers when queue has no agents call queue setting. Number of contacts that were removed from the queue and forwarded to the next step in the dial plan while waiting to be attended by an agent — based on the Timeout queue node setting. Data used to create the ASA, AHT, ATT, and contact resolution totals for the selected queue(s) and date range. This report tracks agent totals and aggregate statistics for the selected queue(s), date range, and agent(s). These results focus on agent performance. Filters the data by specific agents or by all agents in the system. Locate and check the agents to be included in the report and then click [APPLY]. Total talk time an attended contact speaks with an agent for the selected queue(s), date range, and agent(s). Average time an attended contact speaks with an agent for the selected queue(s), date range, and agent(s). Number of contacts attended by agents for the selected queue(s), date range, and agent(s). Number of contacts missed by agents for the selected queue(s), date range, and agent(s). Note: A missed contact represents an occurrence of an agent receiving a call from a queue without answering the call before the defined timeout. There is a high probability that the contact was handled by another agent. Date used to create the TTT, ATT, Handled Contacts, and Missed Contacts totals for the selected queue(s), date range, and agent(s). Displays the device(s) used by the agent during the selected date range. If an agent is logged in on multiple devices, the device name is highlighted blue (hover over for the list of devices). This report tracks the average time a contact waits for an agent in the queue for the selected queue(s) and date range. Averages are usually calculated over a period of time such as a 15 minute increment, one day, or one week. This report tracks the average time a contact waits for an agent in the queue before hanging up for the selected queue(s) and date range. A threshold can be used to set performance expectation targets for agents and/or measure the impact to customer satisfaction due to long wait times in the queue. Tip: Hover over data points to view more details. Tracks the contact resolution counts for the selected queue(s) and date range. This shows how a contact was ultimately resolved. Hover over data points to view more details. Click the contact resolution types at the bottom to display/hide line charts. This page allows you to generate a .csv report based on historical agent or contact data (e.g. view performance from the holidays last year to better staff your call center this year). Unlike the History page, Data Mart allows data older than 90 days to be requested and stored for up to 7 days. To access the data mart dashboard, hover over the left navigation menu and then click Data Mart. In order to access the Manage page in Jive Contact Center, you must have super admin permissions given to you by a system admin. Click to create a new report. The report will only be available for 7 days. Choose Agent Summary for agent data. Choose Contact Summary for inbound call data. Choose a date range to filter your data. Select the queue(s) and/or agent(s) to include in the report. Name by which the report is identified. Time the report was initiated. User that created the report. The report is being generated. The report has been created and is available for download. Total amount of time it took to generate the report. Link to download the report .csv. This page allows you to set target goals for the number of unattended contacts in a queue on the system. When the number of unattended contacts in any queue exceeds the warning and critical thresholds, visual notifications display within the Real Time page (both the All Queue Stats and Queue Details views). To access real time data, hover over the left navigation menu and then click Manage. Enables warning and critical notifications within the Real Time page (both the All Queue Stats and Queue Details views). Number of unattended contacts in any queue required to trigger the warning notification ( ). Note: Value must be greater than 0 and less than the Critical threshold. Number of unattended contacts required in any queue to trigger the critical notification ( ). Note: Value must be greater than 0 and the warning threshold. This page displays queue usage as it relates to pricing for Jive Contact Center. It displays your month to date usage as well as your average monthly usage so that you can evaluate available pricing tiers. To access real time data, hover over the left navigation menu and then click Account. In order to access the Account page in Jive Contact Center, you must have super admin permissions given to you by a system admin. Note: Charges are only applied for the time a call spends in a queue (unattended) and the time the contact spends with an agent (attended). There are no charges for wrap time or calls that did not originate within a queue. With Google Chromecast, you can publicly display your contact center’s performance data on a TV. By making this information readily available to everyone, individuals can be more aware and make real-time adjustments if performance goals are not being achieved. Learn more about Google Chromecast. Before you can launch a wallboard to a TV, you must have a Google Chromecast setup. 1. From the Real Time page, use the queue selector to choose which queues are included in the wallboard and then click [APPLY]. Tip: You can launch a wallboard for an individual queue from the Queue Details page. 4. Select the device to Cast to. The average time a contact waits for an agent in the queue before hanging up. A threshold can be used to set performance expectation targets for agents and/or measure the impact to customer satisfaction due to long wait times in the queue. A contact that left the queue (hung up) before being attended by an agent. A user who is logged in to a queue(s) and handles incoming calls from contacts. A contact that is currently speaking with an agent. The average time used to attend to a contact (time in queue + talk time + wrap time). The average time a contact waits for an agent in the queue. The average time an attended contact speaks with an agent. A person that has called in to the queue. A contact that was removed from the queue and forwarded to the next step in the dial plan while waiting to be attended by an agent — based on the Remove callers when queue has no agents call queue setting. A contact that was removed from the queue unexpectedly while waiting to be attended by an agent. The ultimate state of the contact is unknown. A contact that has been attended to by an agent. Metrics used to evaluate your contact center’s performance and its impact on customer experience and satisfaction. The longest time an attended contact has been speaking with an agent in the queue. The longest time an unattended contact has waited in the queue. The current place of the contact in the queue (order in which calls will be answered). All unattended contacts have a queue position. The number of contacts that were removed from the queue and forwarded to the next step in the dial plan while waiting to be attended by an agent — based on the Timeout queue node setting. The number of contacts waiting to speak with an agent. To add Jive Contact Center Pro to your services, please contact your sales representative. Jive Contact Center Pro offers intelligent, scalable, and powerful cloud contact center solutions to organizations of all sizes. With it, you can enjoy a single, simple-to-use platform that’s compatible with IVR, chat, email, fax, click-to-call web calls, and social media entries through a single interface. To assist in processing the information, customizable reports with 110 possible metrics to choose from are also available. For Jive Contact Center Pro support, please go to inContact’s Online Help.